Why spend a little extra on tomato cages? There’s a simple reason: sturdy durability. If you grow tomatoes every year, then you’ll want to consider investing in cages that last. One of the best kinds we've seen are Gardener's Supply cages. Cone cages (tomato baskets) sold at discount department stores and home improvement centers are less expensive than GS cages. But they’re flimsy. Their tines bend easily. They work only for the smallest tomato plants and don’t withstand strong rains and thunderstorms. The interior support rings are quick to break out when fruit gets heavy. 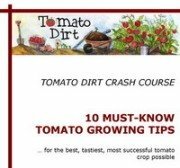 Even if your tomatoes only grow to half their expected size (which likely won’t happen if you read Tomato Dirt! ), your plants will quickly overpower the cone cages. For decades, gardeners have been driving stakes into the ground and tying up branches all season long. Poles, posts, sticks, and branches used to support tomatoes all present this time-consuming problem. GS cages are huge time savers. They’re also healthier for the plants because they’re more stable. Branches won’t snap off as easily. Since plants are upright in cages there is better air circulation. Learn more about GS tomato cages. 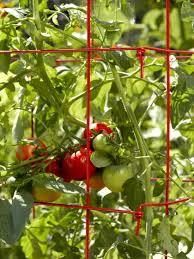 You can also check out different tomato cages to find the right ones for you and your garden. What makes Gardener’s Supply Tomato Cages especially good? Among other things, these babies provide heavy-duty support for tomato plants. That’s especially important if you grow indeterminate tomatoes, which keep getting bigger and bigger as the season progresses. There are several other qualities for you to consider about GS cages. Strength. They’re made of higher-gauged, higher-quality galvanized steel than other cages. GS cages are strong enough to support even the largest tomato plants, which can get very heavy when loaded with fruit. The tines are 7 inches long, which is more than enough to anchor cages deeply into the soil. Other cages (especially the cone variety) have just 2-3 inch tines. Not good when there’s wind. Can you say “tomato topple”? Size. Healthy tomato plants get BIG. Each side of the GS tomato cage is 14 ½ inches. The space between cage wires is large enough (8 inches) to stick your hand in and pick tomatoes. That also means there’s plenty of room for tomato branches to reach out for support. Plants aren’t squished together. Reusability. GS tomato cages fold and lay flat for winter storage. They may cost more, but they last for years. Convenience. They’re easy to set up and you don’t have to keep tying branches. Occasionally you’ll need to prune a sucker or guide a wayward branch back into the cage. Big deal – you’ll save hours. Versatility. If your plants get large – that is, taller than 4 feet – you can add extensions to the GS cages for more height. (Check out the cage extensions here.) Because they’re vertical and well-supported, your tomato plants also get better circulation, which helps prevent diseases from spreading so easily. If you have a small garden or limited space these cages allow your plants to grow upright and save your real estate from tomato sprawl. 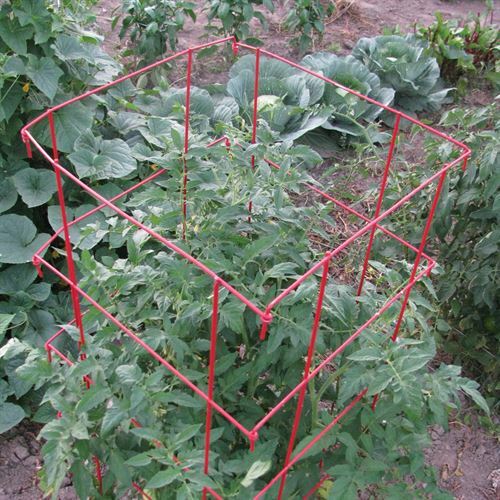 You can also use these cages for plants other than tomatoes, like peppers, eggplants, cucumbers, peas, pole beans, roses, larger dahlias, or lilies.As an added bonus, GS cages deter deer! Unfold cages carefully so you don’t pinch your fingers. Be careful not to poke yourself on wires at the hinges. Place your hands on the welded corners as you insert tines into the ground. That will help stabilize the cage during set up. Keep track of the clips so you can use them each year. Use extra earth staples to ground cages even more, making them more resilient in areas with high wind. You’ll probably need to get the cage extensions. GS cages stand just 32” above the soil line. Most tomato varieties get to be much larger than that. Wire on the cages can rust.